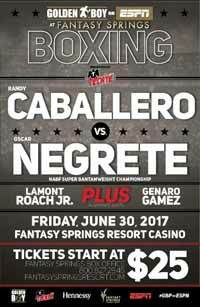 Review by AllTheBestFights.com: 2017-06-30, nice toe-to-toe fight between Oscar Negrete and Sergio Frias: it gets three stars. The undefeated Oscar Negrete entered this fight with a perfect boxing record of 16-0-0 (6 knockouts) and he is ranked as the No.34 bantamweight in the world. In his last three fights he has won over Jose Bustos, Raul Hidalgo and Victor Ruiz. His opponent, Sergio Frias (who replaces Randy Caballero), has an official record of 19-6-2 (10 knockouts) and he entered as the No.26 in the same weight class. He suffered his last loss when he faced Emmanuel Dominguez in 2015 but then he has beat Vic Darchinyan (=Darchinyan vs Frias). Oscar Negrete vs Sergio Frias is valid for the vacant NABF bantamweight title. Watch the video and rate this fight!